Things are revving up for the electric vehicle industry with the help EV charging. According to Inside EVs, sales of new electric cars worldwide surpassed two million units for the first time in 2018. That’s a 72 percent increase over the previous year at an average market share of 2.1 percent. Government mandates are driving EV adoption from China to California. Based on new emissions standards put forth by the European Union, as many as a third of the new cars in the EU will be electric or hydrogen-powered by 2030. The government of India has announced electrification targets, as well. While electric cars may strike some as a modern-day phenomenon, they have been with us in one form or another since the late 1800s. In fact, at the start of the 20th century, electric cars accounted for approximately one-third of all vehicles on the road and seemed destined for mainstream success. However, Henry Ford’s mass-produced, gasoline-powered Model T soon delivered everyday transportation at almost a third of the cost of electric cars. By 1935, EVs had virtually vanished from the roadways. Interest rekindled after the 1973 Arab Oil Embargo, and subsequent developments – climbing gas and petrol prices, warnings of climate change, and concerns about foreign oil dependence – paved the way for the Toyota Prius, Chevy Volt, and Nissan Leaf. Today, the car industry offers many options for adopting EV technology, including models made by Tesla, BMW, Volkswagen, Ford, Kia, and more. Types of EVs include plug-in hybrid electric vehicles that employ driving energy from either their battery or liquid fuel and all-electric vehicles that depend entirely on their battery and electric motor for power. The DOE reports that more than 80 percent of plug-in EV drivers charge their vehicles at home where, in addition to convenience, they enjoy low, stable residential electricity rates. It’s not surprising that people like to recharge their batteries – in their cars and, metaphorically, their bodies – overnight. In addition, the advent of advanced home charging options is helping to allay “range anxiety” for most drivers. 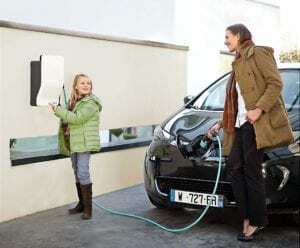 According to the Union of Concerned Scientists, the length of time needed to recharge an EV is dictated by two factors: how energy-depleted the car is and the type of charger you use. Chargers supplied by car dealers at the time of a vehicle’s purchase provide baseline powering capabilities. However, many consumers choose to upgrade – and for good reason. Enhanced EV charging solutions such as the EVlink by Schneider Electric work faster than dealer-supplied chargers. They also deliver a host of additional benefits to give EV owners peace of mind knowing that when they are ready to roll, their vehicle will be, too. As the global specialist in energy management and automation, Schneider Electric delivers innovation through a vast range of smart home solutions, including EVlink chargers. For example, you can integrate EVlink with your home’s electrical system to keep your car from charging during peak-demand times, i.e., when other electrical appliances are likely to be in use. You can also set your charger to power up your vehicle at the cheapest times. Rated for indoor safety, EVlink’s intuitive design facilitates daily use. Each station comes complete with a docking bracket for additional flexibility in installation and usage. And a customized skin allows you to personalize your charger with family photos, team logos, or whatever suits your fancy. Learn more about Schneider Electric’s EV charging offer: EVlink. It was very interesting to read your article. I was particularly interested to hear about the use of EV at the turn of the 20th century! Electric Vehicle use is increasing rapidly within the UK at present. We see many customers asking for EV Chargers to be installed in their properties. A lot of new build houses also have EV Chargers installed now as standard fit. There is a small concern with the increase in EV usage and installation being that domestic householders may be tempted to try and fit EV charging units on a DIY basis. This is obviously highly dangerous and should only be attempted by qualified, registered electricians who are experienced in this type of work. The extent of electric vehicle usage in the coming years may also highlight weaknesses in the power distribution networks. Some of these are already struggling to cope with usage before high powered chargers for electric vehicles are installed.